"Jungle party, zoo outing, birthday party - this cute lion is easy to make and kids especially will love him. You can use other orange vegetables like carrots as well." Spoon hummus into a round bowl and place 2 olives into the hummus as eyes. Cut the third olive into strips for the mouth. Cut off a small triangle of red bell pepper for the nose. Stick halved chives sideways into hummus for whiskers and 2 crackers for the ears. 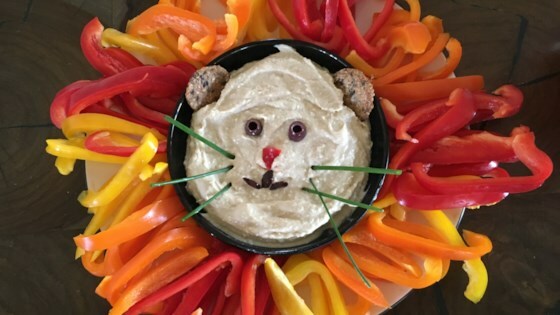 Arrange bell pepper strips all around the lion head as a mane.